Racha Noi South Tip is a completely different animal entirely to any other Phuket diving site. It can be calm and placid and then again on the other hand, it can rip your regulator out of your mouth, in currents that are hard to find anywhere else in the Andaman Sea. If this dive site is to be dived, then care should be taken. The currents come from both sides of the Island and can cause a down ward effect, forcing the diver down when otherwise they may want to ascend. It may be wise to make a negative entry if diving into this site from the open seas and quickly descend taking cover form the boulders is wise. However it is not always strong currents here, but it is better to be prepared just in case. It is wiser to enter this dive site from the safety of the islands wall, rather than going jumping straight into the middle of the site, this has been known to cause problems as divers can become separated from the dive group having differing experience and descent rates. Racha Noi South Tip itself is a formation of huge boulders, which drop to the depth here of 50 meters and beyond, so it is wise to keep an eye on computer depth gauges here too. The boulders start at about 12 meters and drop dramatically down to the deep. This area is fantastic for the large fish that visit the area, Manta Rays and Whale sharks visit here, as the site is a deep drop, they love to swim up from the depths up towards the surface, sifting through the plankton that’s congregates there. The current here definitely attracts the bigger boys. 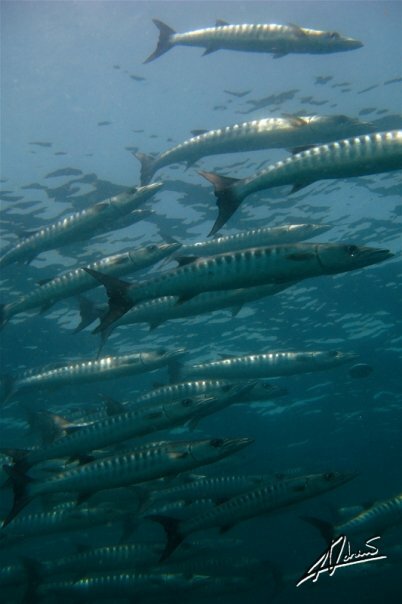 Huge Barracuda, Giant Trevally, Tunas and hunting Jacks fly through the water here using the speed of the current to propel themselves as they stalk prey. For the diver just hovering around top of the boulders is well worth it as the show these fellows put on, is quite spectacular. Anything and everything can show up here at Racha Noi South Point, so be ready. Huge schools of black Fin Barracuda also Yellow Fin over meter long can be seen dashing headlong into schools of scattering fish. The visibility here changes frequently, but is generally very good, but depends on sea conditions 40 meters is not uncommon, but it can drop down top 10 meters. Other marine life includes: White and Black Tip Reef Sharks, Leopard Sharks, Marbled and the Odd Eagle Ray, Titan Trigger Fish. Smaller schools of Barracuda and juvenile Trevallies, blue ringed angel fish and Emperors, Moorish idols, Schooling Banner Fish, Wrasses, Parrot Fish, to name a few.